Locking raised toilet seat with arms adds 4 1/2” of height for comfort and safety. Supportive padded armrests and contoured seat easily lock in place without tools. 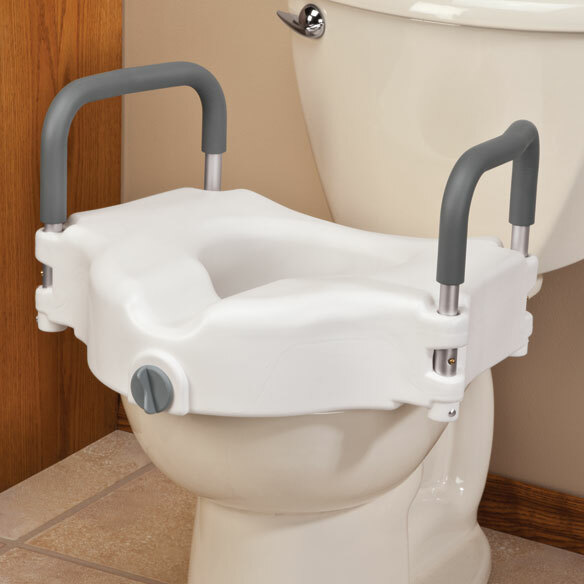 Locking elevated toilet seat supports up to 300 lbs. Plastic, aluminum. Raised toilet seat is 18" L x 20" W x 13" H with 18" between arms. No express shipping. Additional $5 Shipping Charge. When I returned home after my back surgery last May 2012 for a herniated disc that was impeding my sciatica nerve, my husband was at a pharmacy picking up my prescriptions. He surprised me with this product which I cannot rave enough about. My mobility was severely hampered and getting on/off a toilet was extremely challenging and excruciatingly painful. I was using the small window sill and sink edge to give me leverage, but it was uneven heights and was awkward. This was a quick install with no tools needed and gave me added support with the arms so I could lower and raise myself without straining my back and possibly rupturing my new incision. The raised height also took added strain off of my back, as I didn't have to lower myself. Having just come home from the hospital and not having the morphine drip to keep the pain away, this product eased the additional pain caused by having to raise and lower myself a few times a day. The pricing was reasonable, and worth every penny. This product was an incredibly creative and innovative product which will help anyone with limited mobility or who has had back surgery. I will recommend it to anyone I know who has back surgery. For our senior citizens who have mobility issues or stability issues, this is a must-have product. Before my husband bought this product, I never knew it existed. I think the marketing department could be more innovative in their efforts and broaden their scope to surgical patients. This handicapped , raised seat is perfect for us. My husband needed a very sturdy seat with strong arms to raise himself. I was very happy that the seat locked in to existing, elongated toilet without having to remove original seat. Easy to remove to clean. This purchase is better than expected, I am so happy with the toilet seat so easy to installed and so easy to use. I recommend this toilet seat to everyone who has knee and back problems. Had double knee replacement and this was a godsend! Easy to install-just set on toilet after raise toilet seat(I finally removed toilet seat when decided to leave riser on permanently), easy to clean and certainly a bargain!! Purchased 2nd one to leave at son's house. Do not hesitate to purchase this!!!!
. I don't have anymore knee pain. catalog and total was acceptable. I have one already but it needs to be updated. My mother has more arm strength than leg strength at this point. This unit should help her a lot. Hip replacement surgery. Very well made exactly what I wanted. To give it to my Grandmom and she will be amazed by this wonderful tool to avoid knee pain. I am sending this to india. Thanks for this amazing product and I request you to start exporting to india to help many there. Replacing an older one just like this. Has been a huge help after extensive knee surgery. My husband is on a walker and has trouble getting up from the toilet that we have now. This one will give him more lift in getting up and down hopefully. For a friend that is having knee surgery. This is for my Husband too, when he set to long on the towel it hard to get up. I have a raised seat like this one and have had it for over 10 years and I hope this one is similar because I really like the one I have. I needed extra height with the arms on it to help getting down on the seat. Very needed at the time; however, it does not lock to the base of my toilet as it should. It has still been useful, but it is not so secure as it should be. My husband will be having knee replacement surgery soon and the surgeon's office recommended getting one. I need a special toilet seat for lift and sides for safety. Knee surgery is scheduled. I need one that will fit on a rounded toilet. I actually wanted a different one, but it is designed for an elongated toilet. I need it when I travel, most hotel toilets are too low to the floor, so I have trouble getting on and off of them. The handles I hope will help with the higher seat. it looks to be sufficient for our needs..
Bought one a few months ago some where else, thought it was great but turned out to be too tall, my feet dangled!! I've moved and the toilet is one inch shorther, hoping I can keep my feet on the floor this time! Elderly parent having trouble sitting and getting up on their own, this should be a great help. used this item in rehab center after fall. very useful, made getting up & down much easier. It is four and one half high and easy to install. I chose this because i have difficulty getting up due to knee issues. Are the arms adjustable in height? I need them up high for my mom. BEST ANSWER: Thank you for your question. Unfortunately no the arm rests are not adjustable. We hope this information will be of help to you. will # 344447 locking raised toilet seat with arms fit elongated toilet? BEST ANSWER: Thank you for your question. The Raised toilet seat will not fit properly on an elongated toilet. We hope this information will be of help to you. What is the height of the seat itself?. Need only a height of 2 " because I am short. Anyything higher and my feet is dangling of the floor. BEST ANSWER: Thank you for your question. The locking raised toilet seat adds 4 1/2" of height to the toilet. We hope this information will be of help to you. ]Do I have to remove the regular toilet seat? BEST ANSWER: No, just raise both the seat and lid then place the raised seat directly on the toilet. Be sure to secure the seat by tighting it, using the black button on front if the toilet. It may be a little hard to wipe your front if your thighs are a bit large. I use it when I travel so I can have the handles to hold on to in order to get up from the toilet. At home I use a seat without handles, because I have the bathtub and sink close on each side to give me the support I need. I hope this helps. Thank you for your question. No the seat can be kept on but might be easier to remove it. We hope this information will be of help to you. No So easy to use. I take mine when I go to my daughters. Does the seat have a flange that fits inside the toilet rim? BEST ANSWER: Not really a flange, but it does fit directly on the bowl, and when you tighten the dial on the front, it is really secure. We are very pleased with this seat.